Good morning. No Limits will be closing today at 1 pm due to severe weather. We hope that everyone stays safe & dry in this terrible weather! Gorgeous Golden Rod growing in our back yard. We love Native Plants! A newly named Naked Neck Turken on the run! Lucy or Ethel was “struttin’ around” says Zel! Some cooler weather called for having our August Gardening Meeting outside! We are excited to begin growing kale, lettuce, and radishes! Happy birthday Adrian! And thank you for all of your hard work! Be on the lookout next week for the Grand Opening of the No Limits Hot Dog Cart! We will be opening Wednesdays and Thursdays from 11 AM to 1:30 PM and will be located at 24546 Coastal Boulevard in Tasley! Come on by and grab a hot dog and a cold soda! The cart, which will provide supervised PT employment to survivors of brain injury, was generously funded by the Eastern Shore of Virginia Community Foundation!! 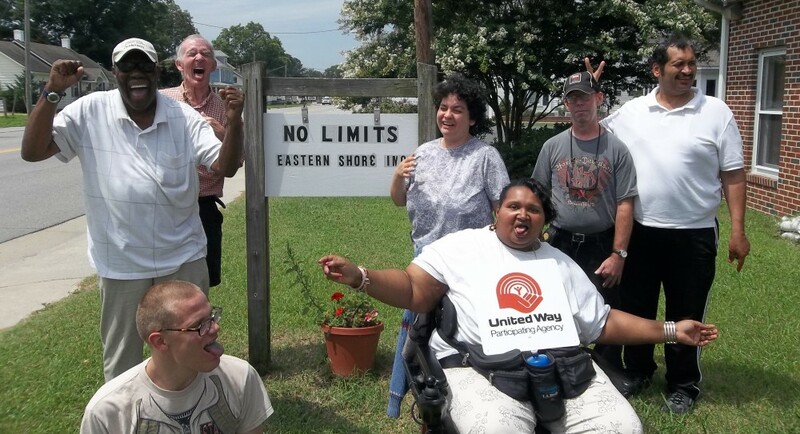 There is a new community-wide scavenger hunt in our area called “ESVA Rocks”. The idea is you decorate a rock, hide it somewhere easily accessible and available to the public, and then wait to see if anyone finds your rock using the Social Media Group dedicated to the challenge. Making Sherry’s birthday cake! Woot woot! Amy dehydrating lemon balm grown in our Pollinator Garden! Thank you to YouthWorks volunteers for helping us to pick the lemon balm! We think there has been activity in our bee house! Are you doing your part to help Native Pollinators on the Eastern Shore?! We grow native flowers and provide bee, bird, and butterfly houses on our property to attract native pollinators! Thank you to the Eastern Shore Soil & Water Conservation District for awarding us grant funding to help establish and upkeep the No Limits Pollinator Garden! Bundick Well & Pump came out to mark our drain fields and taught Zel how to use the “dowsing rods”. So cool! We were told that not every one is able to use these rods to find a drain field. They say that Zel had the magic touch! Good work Zel. We celebrated Amy’s birthday this week! Happy birthday Amy! Visiting with our buddy Matt on an Outreach Visit where we get to spend time with survivors of brain injury who are not able to come to program regularly!